The Public is an activist design studio specializing in changing the world. 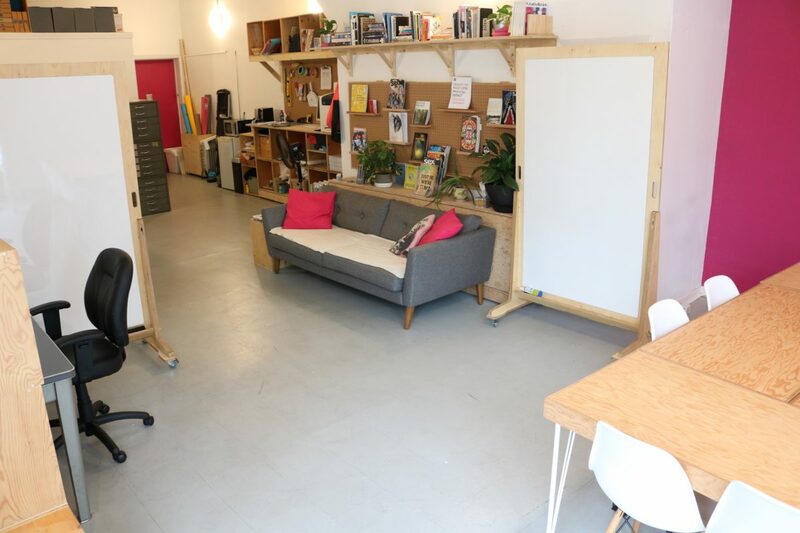 We offer the storefront area of our open-concept studio to rent for workshops, screenings, pop-ups, and meetings for people who share our vision. See below for more details about our amenities and booking the space for your event. 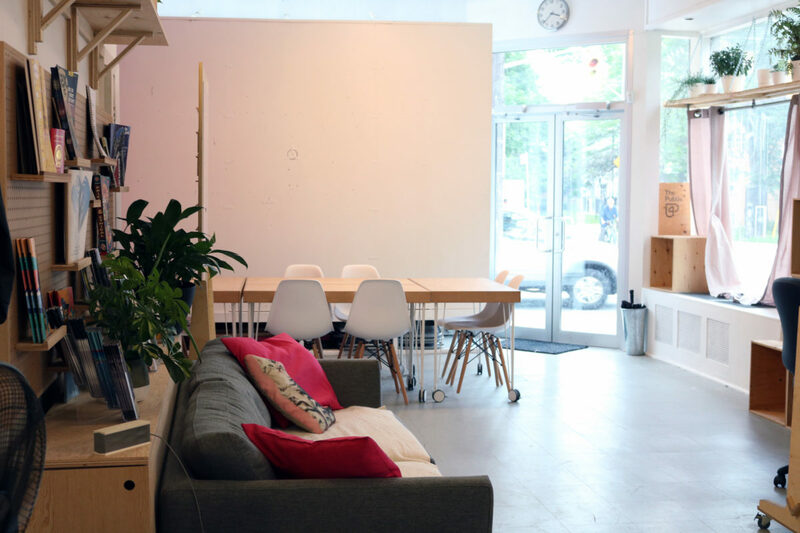 If you have questions or would like to place a booking, please get in touch with our studio manager, Anabel, at anabel@thepublicstudio.ca or 647-477-7474. We have a mix of furnishing that can be booked with the storefront at no additional cost. 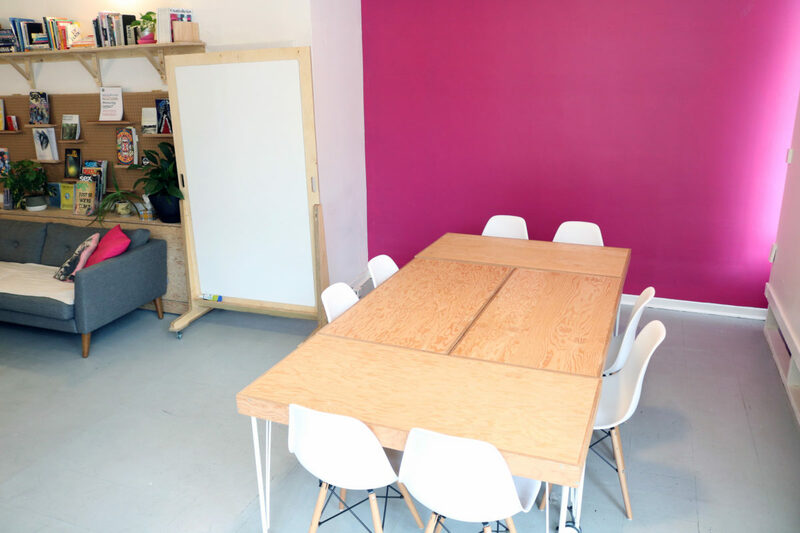 These include: four movable tables (2’ x 4’ each, on casters) which placed together can form a larger meeting table, eight shell chairs, sixteen folding chairs, a couch, and two whiteboards with dry-erase markers. Kitchenette access (sink, dishes, microwave, coffee maker, and shared mini-fridge); projector with remote control, white wall for projection, Wi-fi access. The space is rented at $25/h+HST for a minimum of 3 hours, including set up/take down time and the duration of the event. 18 people in a classroom/workshop set-up (2 facilitators and 16 participants using 4 chairs per table); 30 people maximum. The storefront area measures 16 feet by 20 feet approximately. Our entrance is at street level, has one 4-inch step with a StopGap ramp; non-automatic double doors, with each door measuring 27 inches wide. Our washroom is a single-stall, gender-neutral washroom, on the street level. The bathroom’s doorway measures 29.5 inches wide, the door is non-automatic and has a turning lever handle lock. The bathroom measures 76 inches by 80 inches. The bathroom has grab handles and a sink with lever handles and unscented soap. Our bathroom does not include a change table. Street parking is available surrounding The Public. There is no parking available on-site.